An art exhibit premiering in Ferrara, Italy, that will raise important questions about the role of the artist in creating social change. Issues like human rights and environmental conservation will be some of the topics the artists will be drawing attention to. The artworks in the exhibition can be broadly divided into those focused on raising consciousness regarding sustainability issues, and those that suggest directions for moving forward. 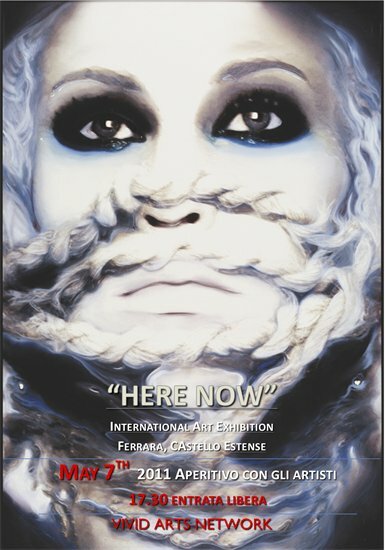 “HereNow” is an International Art Exhibition, organized by Vivid Arts Network of NYC that will open to the public from Satuday May 7th to Friday May 13th 2011 in the Castello di Estense, Ferrara, Italy, one of the nation’s cultural center of gravity. Iit comprises works by a selected group of artists from all over the world and includes many new works in all disciplines. What sensational art! And I didn’t think I liked modern art, but I liked viewing your show in Italy very much! You should be proud to be associated with this prestigious show! I love this painting…is it a painting or is it a picture that u took and added the creative expression and rope. Human rights and global issues are my passion along with art. I saw the person’s soul in this one…. Thank you for acknowledging the damage that discrimination causes at any level.